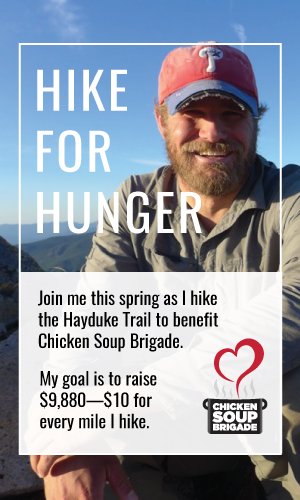 The Hayduke Trail is named after a character in Edward Abbey’s book “The Monkeywrench Gang”. While I’ve never read that book, I have read “Desert Solitaire” about his year spent as a National Park Ranger at Arches in the 1950s. There’s a section somewhere in that book where he talks about the burgeoning autotourism market in the parks. His belief is that you’re not able to experience the beauty of the land unless you get out and walk awhile in it. 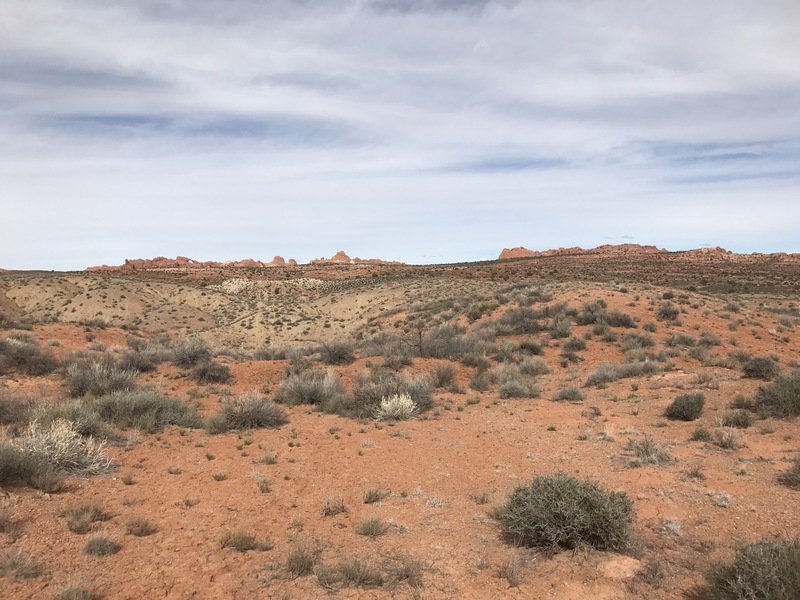 Since his time at the park, tourism at Arches has exploded to the point where NPS has actually closed the only campground in the park this season as they work on replacing all the roads. I’m sure Abbey would have been rolling his eyes if he had seen how many cars there were in his beloved park. At the same time though- there were hundreds of people out hiking too which is great to see. Before being swamped by the hoards in the Devil’s Garden I had a nice quiet morning- only seeing one other person. 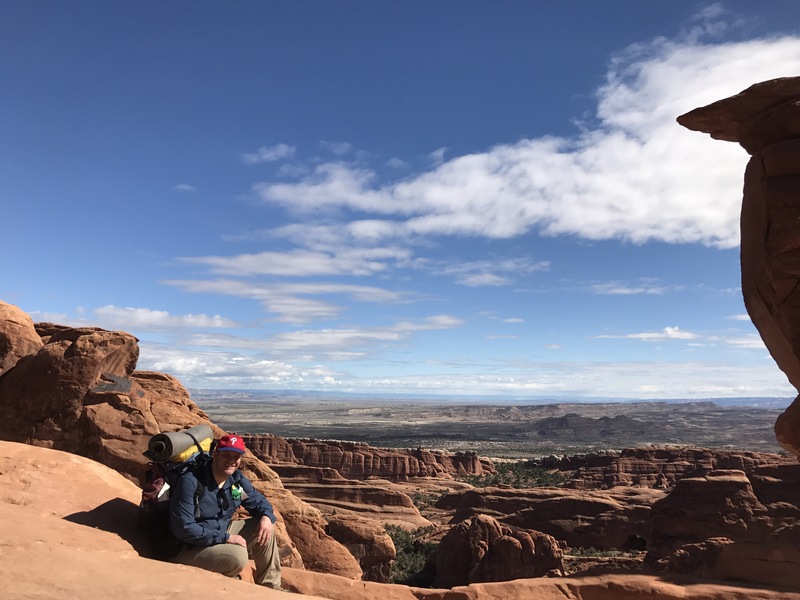 I was out of camp by 7:30, and made the easy cros country jaunt to the Tower Arch 4×4 road. Tower Arch is tucked into the back side of the Klondike Hills and therefore isn’t quite the destination spot, though it’s one of the bigger one I saw! 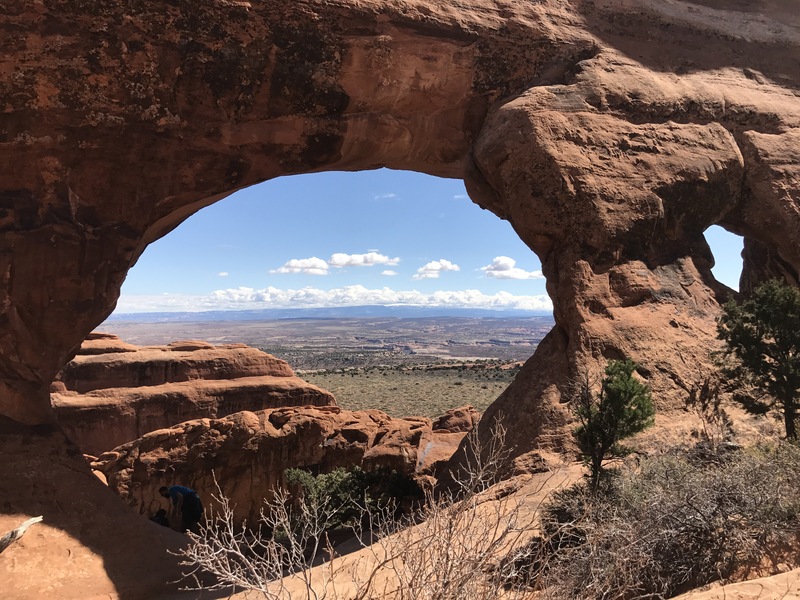 Tower Arch – the only one all day I got completely to myself. From there the trail threaded between the Bluffs and the massive Marching Men. One thing that struck me all day was the difference in perspective for so many of these features. From a distance last night the Men looked more like a long fin. Going by them you saw how massive each individual spire is and how spread out they were. It’s also fascinating to me how the world looks (is) angled. The Bluffs slope one way- the Men another. I topped out and left the red dirt for a cross country trek across the green Salt Valley to another alternate route. The cross country trekking has been a little stressful for me today. Not because of navigation (that was all very easy) but because of the soil. Much of the soil here is actually alive! Cryptobiotic soil forms the crust on the ground and is very fragile- one footstep can set back years of growth and damage the ecosystem. 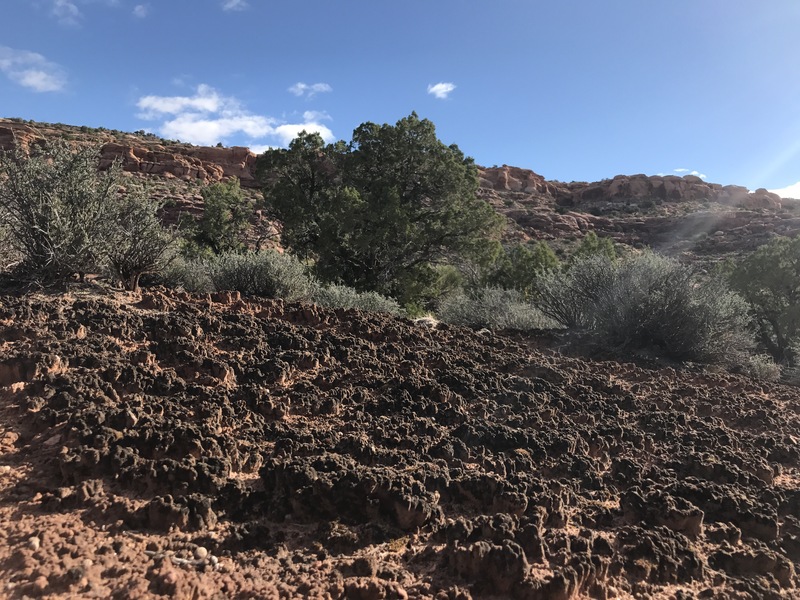 It’s best to hike on the slickrock or in the sandy wash bottoms, but sometimes that’s not possible. I carefully picked my way through the fields avoiding as much as I could. Watch your step! Cryptobiotic soil is very fragile. I arrived at Dark Angel- another monolithic tower- still alone. 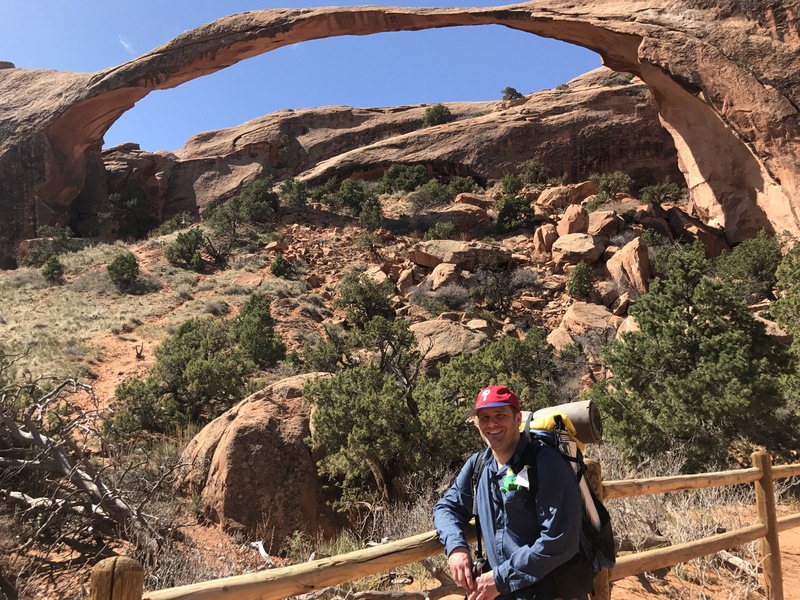 By the time I hit Double O Arch about 10 minutes later it was on. Tens of Arches and Hundreds of people on the trails! I was expecting some folks, but not nearly in this volume! 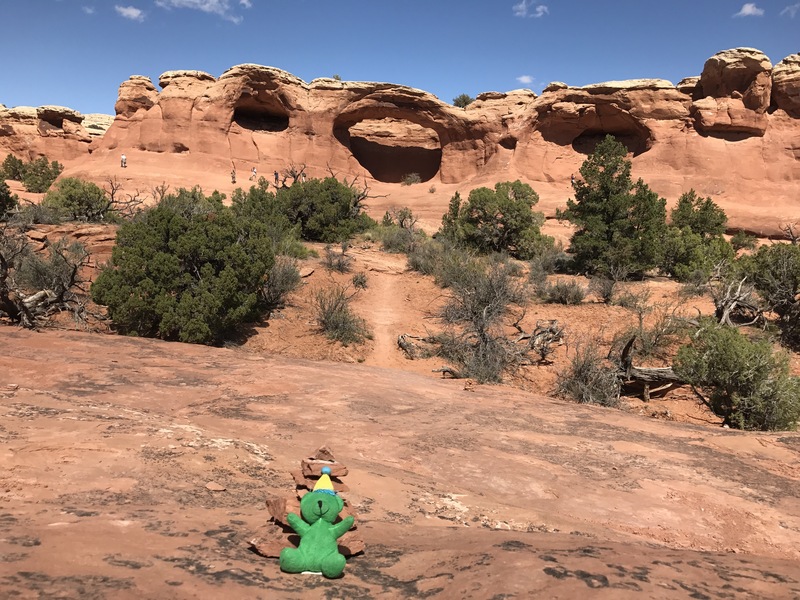 Over the next three hours I meandered my way down the trail- taking every possible side trail to see as many Arches as possible. I’m here now, right? I saw eight total- I think. Each one had its own flair. Partition Arch offered beautiful views through it. Navajo Arch was quiet and cool- with a tree! 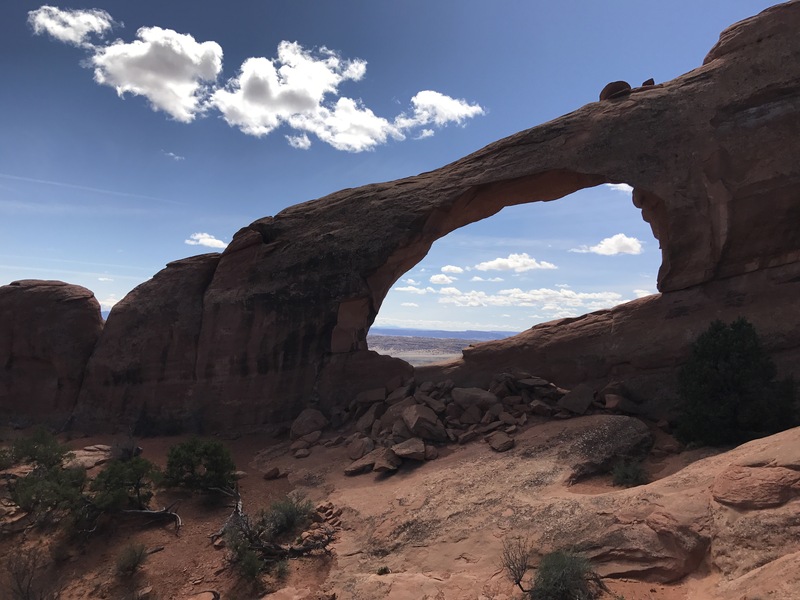 Black Arch held a bit of mystery from its distant overlook and was surrounded by stunning scenery. 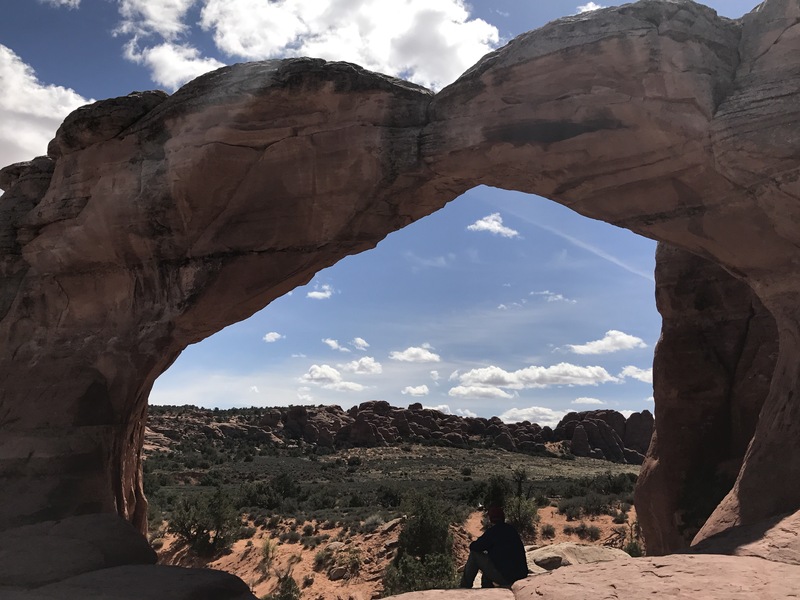 Landscape Arch offered a delicate beauty with its thin long lines. It was a beautiful place for lunch. 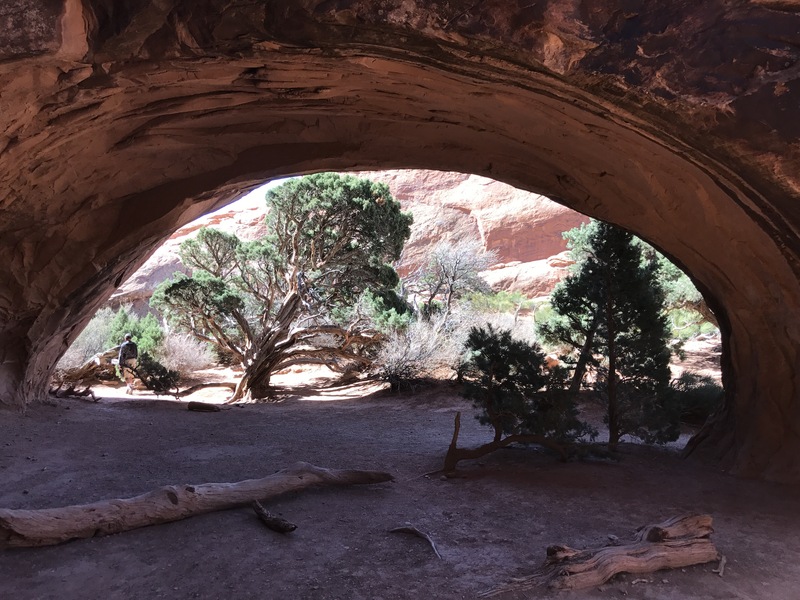 After lunch I breezed by Pine Tree Arch and Tunnel Arch before landing in the full parking lot. Trekking along the road for a bit I turned off into the closed campground where I took in Skyline Arch- impressive from the front, more impressive from the road when it literally sits at the top of the Skyline. Another short loop took me by my final three Arches of the day- Tapestry Arch (3 in one!) Broken Arch (my favorite- and the trail actually goes right through it!) and Sand Dunes Arch. Out of the Devil’s Garden I began the trek back across Salt Valley on dirt roads and following the natural gas pipeline cross country. I was again completely alone- all the crowds left in that one section. At one point I was concerned that the crypto soil was everywhere, so I diverted into a sandy wash. It took me a little off course, and did a big number on my feet ( I dumped a ton of sand out of both my shoes and socks!) but it was the right thing to do. 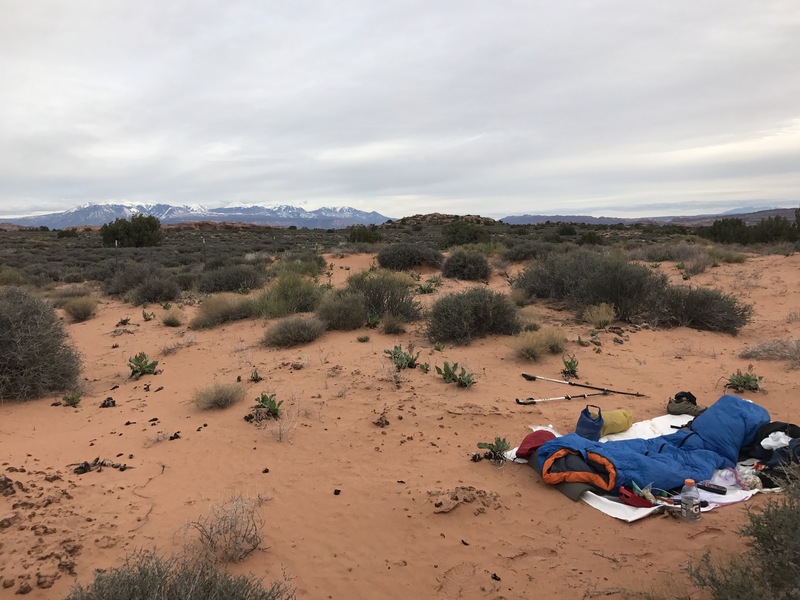 I’m now camped just outside the park along the boundary fence with a beautiful view of the La Sal mountains snowy peaks in the distance. My feet are tired and I even have a blister! It’s hard to believe how much you can pack into. Today was mostly on real trail- and incidentally almost entirely on “alternate” routes. Tomorrow will be another alternate routes by Nic Barth- all cross country. Let the fun begin. Oh yeah!! You might notice I have a little friend in some of my photos. That’s my niece Lydia’s Geopet. She has travelled to Japan, Kenya, and Alaska, and is really excited to see Utah! Love seeing your trip so far! Looks amazing, Lisa and I were wondering how you are able to write these posts and send them? I imagine some tech thingy for your phone that connects you…..Lisa proposed that maybe your were stopping at libraries (she doesn’t get yet why I’m still laughing so hard). Can’t wait to continue to follow you! 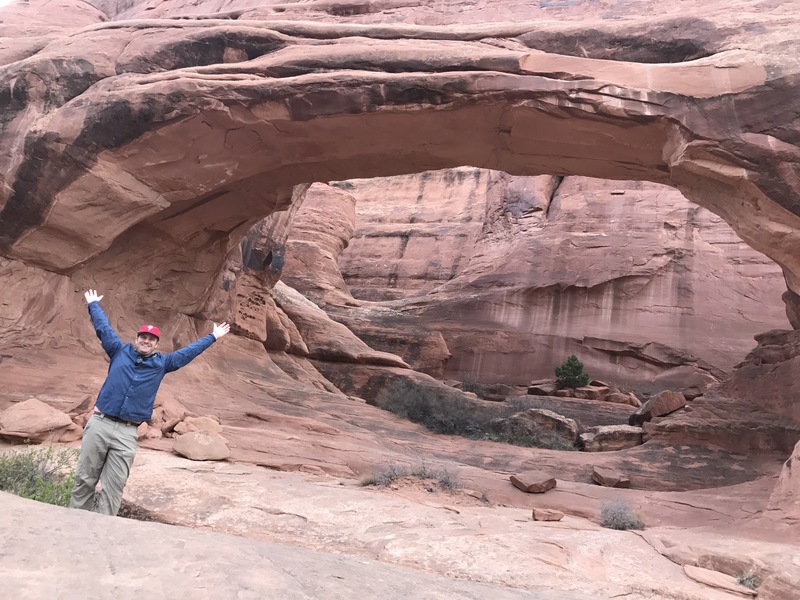 I saw the arches a long long time ago and it’s so fun to see such a different area of our country. Thanks Mo! I can upload from my phone, but only if I have data access…which I haven’t really had since Arches, hence the lag in getting some of these up. Hope all is well! I thought those were your Merrill tracks ahead of us on the pipeline! So far the cryptobiotic soil is my #1 unexpected challenge of the Hayduke. I am glad you’re looking out for it too! I’ve been following a set of merrills too… going east and west bound! The crypto has definitely been tough. I try to look for cow or deer tracks through it, but Sometimes I find myself without another option though and just apologizing to the soil as I try to tread as lightly as possible on it.